Mt. 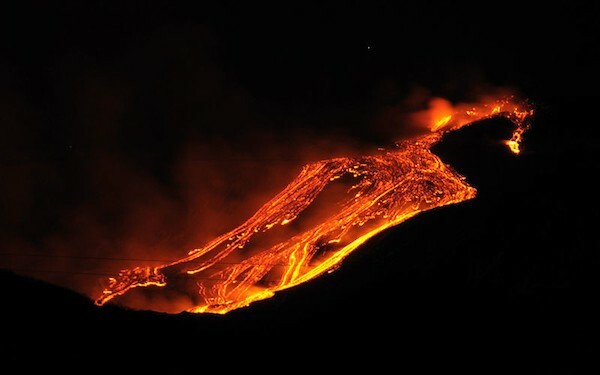 Etna in Sicily, erupting on Jan. 12, 2011. How often do you feel like you have to keep a lid on things -- your emotions, your sexual urges, your ambitions, your full power? Probably a lot of the time, right? After all, most social and professional situations call on us to temper our more primal sides in favor of being polite, proper, cool and in control. But what if I told you the current astrology is ripe for some of that subterranean stuff you usually hold back to come bursting forth? Would it scare you, excite you, or simply feel like a relief? What if you were to look at such an emergence simply as yet another step in your personal evolution; just one more facet of yourself to embrace and integrate on your way to wholeness? After all, humanity has a long history of sexual desire (as well as emotions, power and evolving). None of this is new material, though it might feel new (and therefore unusual) to express it in the way the astrology is indicating -- and still have it be productive, rather than destructive. Of course, one key to working with it productively is to own it. That deep, seemingly mysterious place under the surface where your sexuality, emotions and body intersect is all yours. Trying to project it onto others won’t work; yes, they have their own lusty nexus. And you have yours. Lust, huh? You might be thinking, “Isn’t that one of the Seven Deadly Sins?” It is; but remember who decided that it’s a “sin” -- and why, and what certain institutions have done to millions of people in the name of “saving” them from this “sin.” True, it is not always appropriate or beneficial to act on one’s lust. But neither is it healthy to weigh it down under a mountain of guilt, shame and fear. Molten goat? If that image does not work for you, try imagining a volcanic mountain range. It’s solid and strong and seemingly impermeable; but deep within is the magma that actually made the mountain. That magma is hot and looking for a way out. Will it ooze gently and carry you along as it reshapes the landscape? Or will it erupt suddenly, taking the top of the mountain with it and laying bare the power within? Both scenarios are possible, in terms of how your emotions, your body, and your sexuality may find expression. Current astrology provides an invitation to get in touch with this layer of yourself and your feelings about it. To the one side of Venus-Pluto is Mars (and Black Moon Lilith, a hypothetical lunar point) in Scorpio. From Scorpio to Capricorn is a sextile -- a harmonious, flowing aspect that only asks for some active cooperation from you to help things along. This looks like the image of someone who’s willing to take the energy on, who perhaps is already doing their inner work with deep emotions, the shadow feminine, and their desires, and is open to doing more. Which is not to say that you’ll avoid any “eruptions” if that description fits you. Venus-Pluto in Capricorn has a potentially eruptive quality all on its own (and could signal an eruption of jealousy), even without any help. Yet it does have help. Vesta (an asteroid) and Uranus are conjunct in Aries, making a square to Venus-Pluto. Squares are the aspect of dynamic internal tension in astrology; the sense of feeling like you must do something to relieve it. In taking action, you also integrate whatever factors seemed to have been pushing on you to choose and move. Although the era-defining Uranus-Pluto square is no longer exact, it is still close and quite functional. The sexual and emotional energy of Venus and Pluto, which is looking for an outlet, have an evolutionary function -- and embracing it could feel quite revolutionary. Especially if Uranus (in a Mars-ruled sign) pushes out of you something that you’ve been trying very hard to suppress. Vesta adds a touch of the devotional; as in, devoting yourself to this process of self-discovery is integral to feeding your inner spark. The more self-directed you can be with it (as opposed to reactive), the better. Finally, note that the Moon will be in mid-Capricorn as Venus-Pluto is exact, sweeping through the aspect just afterwards. As mentioned, your emotions are deeply tied to this process, and efforts to mask them behind a poker face do not look tenable in this scenario. The urge to do so is likely related to very old past conditioning from childhood. Feel free to question it; it could be fun.